Note! - for a cooling tower based on evaporative cooling the maximum cooling tower efficiency is limited by the wet bulb temperature of the cooling air. The temperature difference between inlet and outlet water (ti - to) is normally in the range 10 - 15 oF. The water consumption - or the amount of make up water - of a cooling tower is about 0.2-0.3 liter per minute and ton of refrigeration. Compared with the use and waste of city water the water consumption can be reduced with about 90 - 95%. 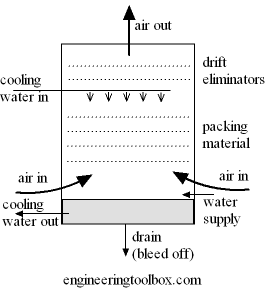 Both types are based on evaporative cooling. Note! - be aware that a medium temperature system - like cooling a tower - are a known source of pathogenic bacteria causing the Legionnaires disease. Good cleaning and maintenance of the systems are important to minimize the risk. Engineering ToolBox, (2004). Cooling Tower Efficiency. [online] Available at: https://www.engineeringtoolbox.com/cooling-tower-efficiency-d_699.html [Accessed Day Mo. Year].